Monsoon Takes A Break; Tibetans Celebrate Dalai Lama's 80th Birthday : Goats and Soda Tibetan refugees in Dharamsala, his home in exile, sang, danced and told us what their spiritual leader has meant to them. Tibetan men living in Kathmandu, Nepal, danced Monday during celebrations to mark the 80th birthday of the Dalai Lama. This weekend the monsoon started pouring down on the hilly streets of Dharamsala in northern India. But the rain held off on Monday as thousands of Tibetans gathered at the town's Buddhist temple to celebrate the Dalai Lama's 80th birthday. 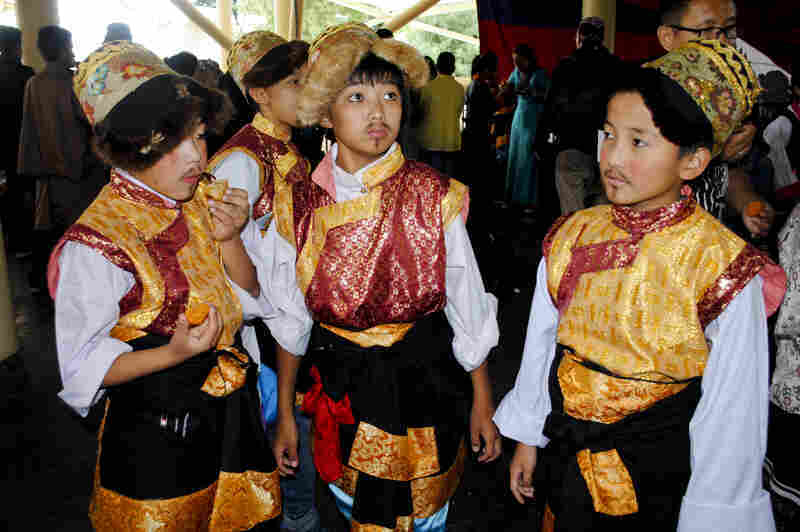 Tibetan children in Dharamsala, India, wait to perform during Monday's celebration. All morning, Tibetan schoolchildren in costumes of silk brocade and big fur hats sang and danced as they strummed traditional lutes. When they stamped their wool felt boots, the crowd went wild. Wizened elderly people, toddlers, monks and nuns, students in school uniforms, teens with spiked hair, couples and families alike sat in the courtyard under a misty sky. They cheered the performers and munched samosas and ladoos, Indian sweets, handed out to the crowd. A huge celebration already took place in Dharamsala, the Dalai Lama's exile home, on June 21 in accordance with the Tibetan lunar calendar. The Tibetan spiritual leader himself was in California on Monday at a compassion-themed conference. But thousands of Tibetans celebrated the birthday of their revered leader a second time in the foothills of the Himalayas. They're part of a community of more than 100,000 exiled Tibetans living in India; they followed the Dalai Lama when he fled his homeland in 1959 after China's siege of Tibet. This birthday is a big milestone in a remarkable life. Who else has had conversations with Chinese leader Mao Zedong and Barack Obama? Who else has been hugged by punk legend Patti Smith and cavorted with neuroscientists — and is writing a book about joy with fellow Nobel Peace Prize Laureate Archbishop Desmond Tutu? 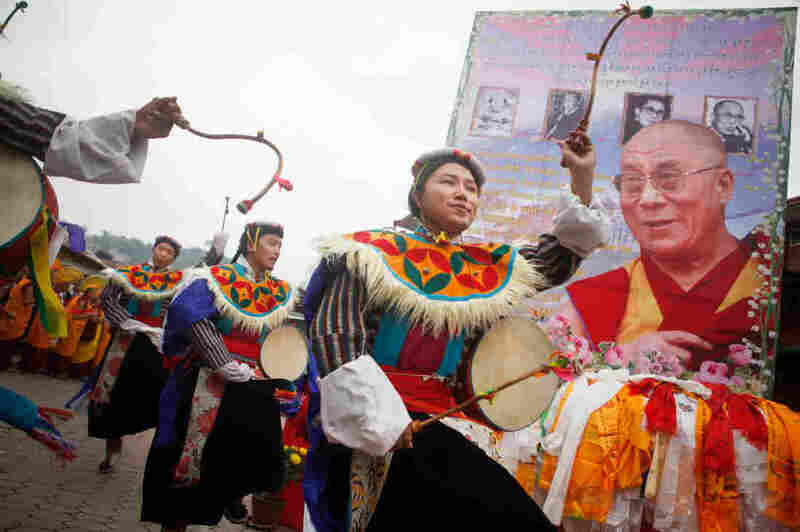 As they celebrated, Tibetans in Dharamsala shared their thoughts about the Dalai Lama. Lobsang Thukjee, a monk in his early 40s, fled to India in 1992. He walked 23 days from Tibet to cross the Nepal border. The shoes he bought for a few dollars fell apart during the journey over rocky terrain and mountain passes. The sun scorched his face. Thukjee remembers a mountain that seemed to go on forever. "I think it has no end," he recalls. His feet hurt dreadfully, and he couldn't breathe. He wanted to turn around. But then Thukjee focused on getting to India and seeing the Dalai Lama for the first time. He thought, "Step by step I am closer to His Holiness." So Thukjee kept walking up the mountain. He prayed: "Please, please help me." "Finally," he says, "I was over the mountain." Lhakpa Kyziom, a 32-year-old journalist who reports on Tibetan issues, was born in Dharamsala. Her memories of her parents are dim; they both died when she was a small child. She was raised at the Tibetan Children's Village, the main Tibetan school in Dharamsala. Kyziom remembers the Dalai Lama visiting the school during her childhood. "He would meet each and every child, holding our hands, seeing if we were well-fed and clean." When the Dalai Lama arrived in India, his first priority was to establish a school for Tibetan children. Over the years, he urged modern education while also maintaining Tibetan traditions. "What I am today is because of the school," Kyziom says. "The school gave me the parental love that we were deprived of. I'm so fortunate to have grown up in that community. Because of that I am serving the community." Tenzin Lhadron, a Tibetan Buddhist nun in Dharamsala, India, says the Dalai Lama paved the way for nuns to pursue higher studies. Tenzin Lhadron, 39, is a nun from Ladakh, in remote northern India. She moved to Dharamsala in 1988 to study intensively. Unlike monks, nuns in Tibet traditionally have not pursued higher Buddhist studies. But in the last few decades, the Dalai Lama sparked changes in religious institutions that let nuns study as well. "He encouraged us," says Lhadron. "In the beginning we didn't have anything. Now we have so many nunneries." In the early 1990s, Lhadron was part of the first group of nuns who learned to debate Buddhist logic as monks have always done. The Dalai Lama observed them and the next day gave a 40-minute briefing. "He told us what to do, how to do," says Lhadron. "That really stayed strongly in my heart." Thuten Jyantso, 71, hails from eastern Tibet, where he was a nomad. He came to Dharamsala in 2003. Because of the Dalai Lama, "we have this wonderful achievement in exile," he says. "Education and culture is because of his guidance." The Tibetan school system in India has educated tens of thousands, and cultural institutions preserve language and heritage. Jyantso, who has a weathered face and rheumy eyes, speaks eloquently as he fingers prayer beads. 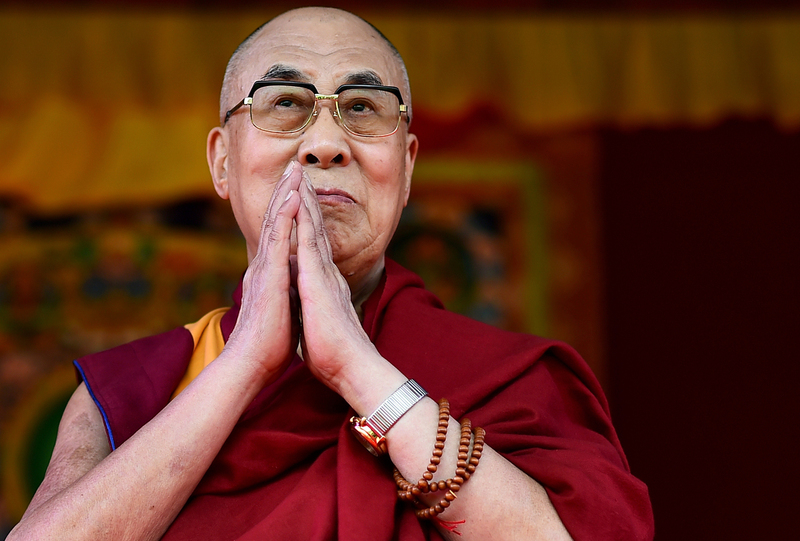 "His Holiness is seeking autonomy. It's the only solution for Tibet and China. We're not against Chinese people. A few narrow-minded leaders in China don't accept or respect His Holiness and what he is seeking," Jyantso adds. "I hope negotiations with China will start again to solve the problem as soon as possible." On June 29, the Dalai Lama spoke on "Buddhism in the 21st Century" and dedicated the local Buddhist community center in the British town of Aldershot. Tenzin Pasang, a 9-year-old born in Dharamsala, put it simply. The Dalai Lama is "a very compassionate and very kind man," she chirps. "He will live many years." Then she raced off to play with her friends before the rain fell again.